Facilities include numerous exercise areas across two floors, dedicated fitness studios, outdoor training arena, Olympic size swimming pool, running track and Yoga lawn. 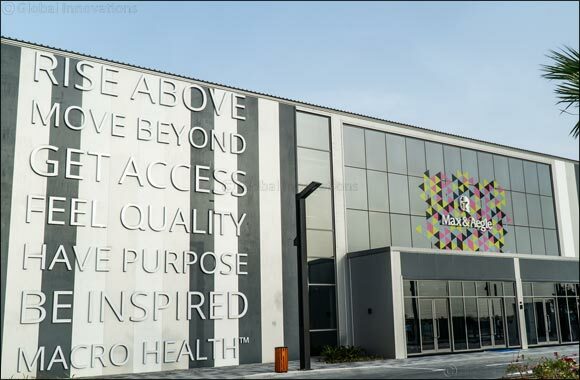 Dubai, United Arab Emirates (6th February 2019): A new and highly innovative concept in health and fitness has been launched in Dubai, which focuses on the principles of ‘Macro Health™’, a term which describes a unique holistic approach to wellness. Max & Aegle, located in Meydan and developed by Meydan Group is a 500,000 sq. ft purpose-built wellness destination housed in a two-storey building, surrounded by a landscaped outdoor area. It is unprecedented in terms of its sheer scale, the facilities it boasts, and its focus on personalized training and wellness. The facility has the capacity to accommodate 5,000 members, but this will be limited to 2,000, ensuring that every member can fully benefit from every visit. Unique to Max & Aegle is its keen focus on the principles of Macro Health™, a term which it has trade-marked, and which represents a new way of delivering dynamic health solutions for the mind, body and soul. Macro Health™ is a seamless complete spectrum of health and wellness, rather than just a pre-occupation with isolated fitness objectives such as improving stamina, building body mass or losing weight. The aim is to ensure that every member feels energized, not fatigued, informed and not instructed. Inside, the fitness area is spread across two floors and boasts designated cardio, weight training and circuit areas, while group exercise classes will be held in dedicated studios for High Intensity Training, Boxing, Yoga and Cycling. Outside, an Olympic size swimming pool, along with the kids’ splash pool is set within a landscaped and shaded relaxation deck. There is also a 1,400 metre running track, two dedicated areas for outdoor fitness training and athletics, and a large Yoga lawn offering spectacular views onto the Downtown skyline. The membership experience at Max & Aegle starts with an initial Fit3D Pro Body scan - with its state-of-the-art body composition analysis – which helps to determine the best approach to attaining fitness and optimal health. Industry-leading coaches then work closely with each member to choose the ideal programme for them to lay the foundations for a new way of delivering total health solutions. The team at Max & Aegle have been carefully selected for their expertise and experience, offering specialisations in conditioning, agility, performance, injury prevention, sports specific and functional training, as well as yoga, martial arts, cross training, and interval training. The training equipment represents the most revered brands, including Life Fitness, Hammer Strength, Arsenal and Prime, with Fitmetrix Software used for personal training. Max & Aegle is the brainchild of businessman, Zafer Taher, who has worked closely with Meydan Group to bring the project forward. The aim has been to create a welcoming and inclusive environment where members can be expertly guided by professional trainers while setting their own pace, and not feel under pressure. In addition, the benefits of relaxation have been considered, with an understanding that many members will desire a place to socialize, eat and unwind as well as exercise. In the next few weeks, a new and ambient restaurant, providing healthy eating options, will open. Zafer Taher comments: “We wanted to create something very different to what is already in the market. Almost all fitness operators in the UAE are accommodated in office or residential buildings so they are compromised in terms of the space size, facilities and equipment they can offer their members. Working closely with Meydan Group, we have been able to design the building around our vision and the keen desire to provide members with a very wide choice of activities, fitness classes and work-out options in an ambient and relaxing environment, working within the principles of Macro Health™”.